This weekend we had rain. Yes people, rain. It was a nice change from snow and a sure sign that spring is here. Or so I thought until I looked out the window this morning. Ick. That's neither here nor there though, we're talking about rain. The kids had to keep making sure I was really saying that it was Ok for them to jump in the puddles. I know I'm uptight sometimes but that's why I bought the rainboots -- to have a little fun. 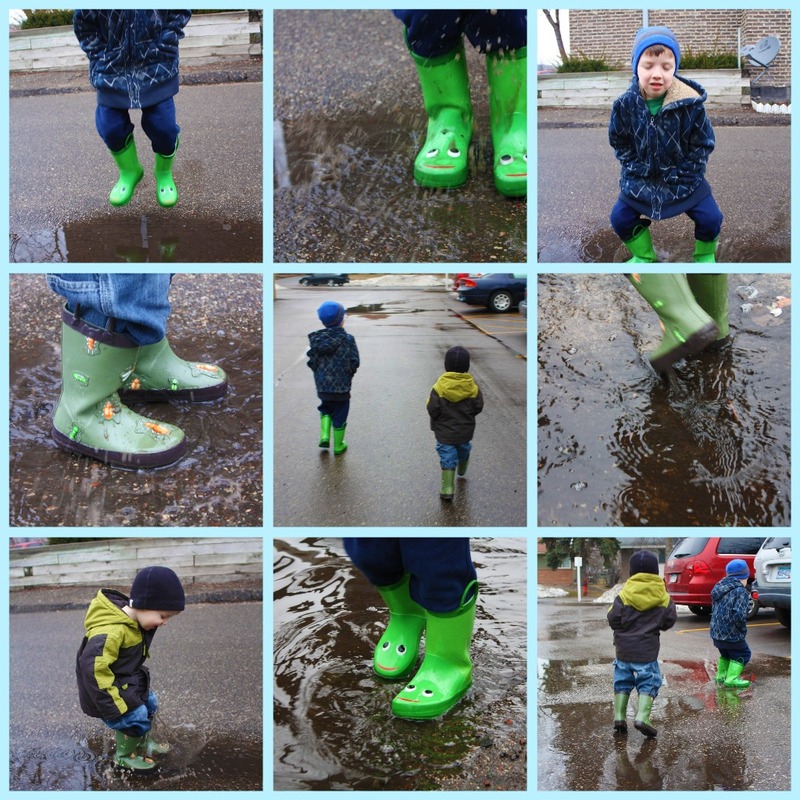 :) Can't wait until it gets warm enough that we can splash in the puddles without big coats and hats. Happy Spring everyone! Last weekend I went down to Fairmont for a little R and R. By last weekend I mean the weekend that happened over a week ago -- I'm a little behind. I've been busy and haven't taken the time to write which I really like doing. I also haven't taken the time to take pictures which is one of my favorite hobbies. :( I'm taking the time now. Anyway, back to my story. I planned to go to Fairmont initially to do a Lia Sophia party. I've just become an advisor recently (needed to find something to keep me busy when I didn't have the boys and help fill up my bank account at the same time) and my cousin's wife Lori said that she would host a party. Thanks Lori! We had a great show -- I was able to bank a little money and spend time with the girls. The weekend turned out to be so much more than a great party though. Friday night I got to hang out with my mom. I had such a great time!! It's rare that my mom and I get to hang out -- she works weekends which is when I end up going home. She had the night off and we hit the town! Ok, it's Fairmont, how much "hitting the town" can you actually do. We went to the Legion for a meat raffle. That's right folks, a meat raffle. You may have seen me post about it on Facebook. I had a few too many drinks (3 -- I don't have much of a tolerance), ate, and then had a few too many more. I won pork chops and steaks in the meat raffle and the best part of the night is that my mom paid for everything. Kidding here folks, the best part was hanging out with my mom (the not paying anything part was just a bonus). Saturday was the party and then my dad came to town. Woo hoo! I hadn't seen him since Christmas so it was great to see him. He had hair! I didn't take a picture because I was preoccupied with everything that was going on but I will be going to visit him in a month and will take plenty of pictures then. We went out to dinner that night with my extended family -- loved getting to see everyone. Got to see them again on Sunday for brunch. An added bonus . . . my uncle from California came to town so I got to see him too. I know that you're thinking that my weekend couldn't get any better than that, but it could. The icing on the cake is the fact that I got to bring Jackson with me. I don't get to see him very often and since it was Mike's weekend with the boys it was nice to have some company along. Jackson never complained about my singing in the car either. The only downfall to my weekend was the weather on the drive home. It cleared up after awhile but when I got out of the car I saw that the snow / ice had attached itself. Thought it was a kind of cool pattern. Thanks for listening to my wordiness this evening.